Having recently been made the face of Tiffany and Co's new Legendary campaign it's not surprising to see Lupita wearing Tiffany and Co on the red carpet. 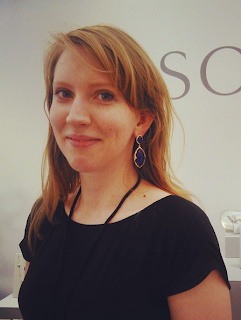 Her earrings are made with tanzanite and diamonds. One of the two cocktails rings is an 8.21-carat yellow diamond ring and the other is a 15.75 carat sapphire and diamond ring all from Tiffany and Co.
Also as one of the editors for Love Gold Lupita really knows her stones and has great taste. Lupita has cleverly mixed different gem stones including sapphires, tanzanite and yellow diamonds to compliment her House of Herrera dress and head dress. The shot blow gives us a little closer look at the pieces along with Lupita's other accessories for the evening. 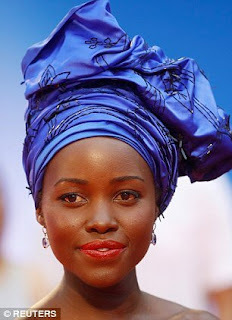 With her brilliantly blue head dress and signature red lips Lupita keeps the focus on the earrings as they are perfectly set against her face and easily spotted in all the photos below. Translucent stones can be challenging to do this with but the tanzanite colour is outlined clearly by the diamonds set around it.